Ryde Aquatic Centre is a state-of-the-art aquatics facility located in Ryde, and one of the best swimming pools in Sydney. The centre’s original venue was demolished in 1998 to pave way for a modern leisure centre that first opened its doors to the public in 2000 – just in time for the Sydney 2000 Summer Olympics. 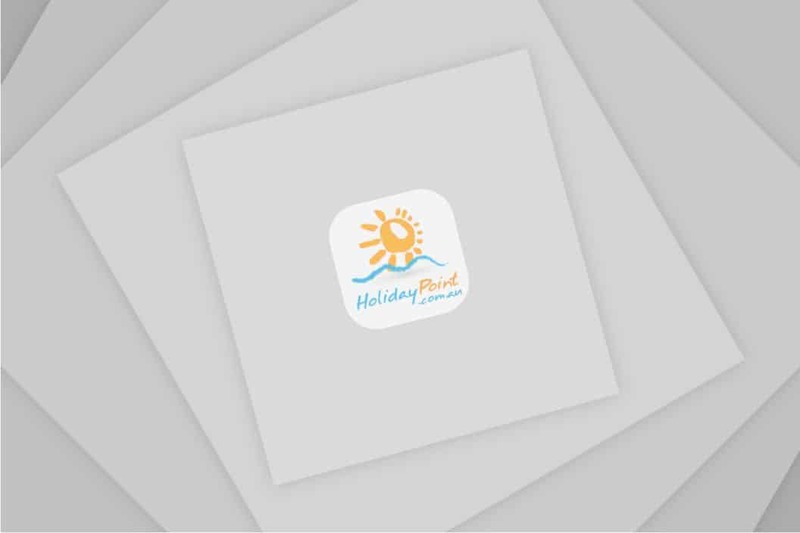 This aquatic centre is popular with families looking to escape the city’s buzz and settle into a relaxing indoor space where the kids can enjoy a variety of water activities. The little ones get to enjoy the baby pool and a mini slide, which allows them the thrill of water adventures. What’s more, both the baby and toddler pool have bubble jets, which certainly makes for a fun experience. Add to this the statues of famous cartoon creatures and it is easy to see why this leisure centre is popular with families. There is no shortage of fun experiences for the older kids as they have a giant 56 metre waterslide. 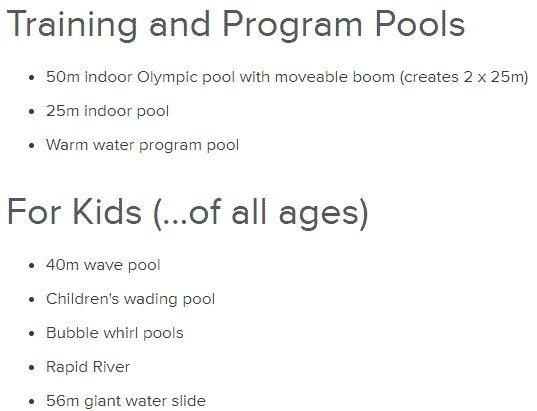 In addition to the facilities at Ryde Aquatic Centre, the centre also hosts an array of programs that encourage visitors to lead a healthy lifestyle; the ‘Learn to swim’ program being one example. It offers swimming programs that are ideal for everyone, from infants to adults; including those with special needs. One of the most exciting options at is the Surf Ryder. Just as the name suggests, this is the perfect place to go surfing indoors. Whether you are a newbie looking for a new hobby, or are an experienced surfer, this all-weather heated surf simulator is fun to try. 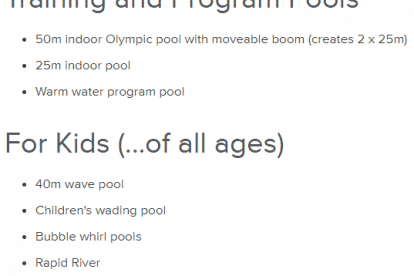 Note that standard pool entry is included. Each session typically lasts half an hour, and caters for up to 12 people per session. 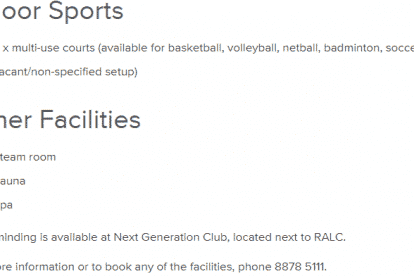 The centre also provides the chance to engage in indoor sports that range from soccer, futsal, hockey, volleyball and netball, among others. Treat your little one to a special birthday celebration with the various birthday packages available. 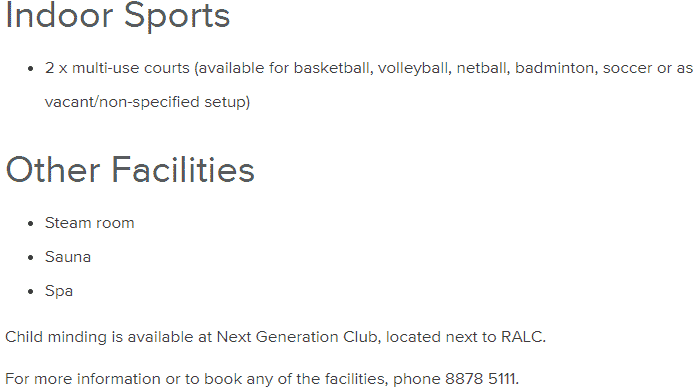 Ryde Aquatic Centre is located on 504 Victoria Road, with free onsite parking available.